The Cardiff Millennium Centre, often referred to as the Wales Millennium Centre, is located in the Cardiff Bay area and spans a site of 4.7 acres. An arts centre boasting a showcase of opera, ballet, comedy, musicals and dance, it is a definite must-see if you’re planning a trip to the area. The Centre comprises three theatres, the largest of which (the Donald Gordon Theatre) seats 1, 897 people at full capacity. Perhaps unsurprisingly, a grand total of 8 arts organisations are also housed there. To match its impressive size is the astonishing architecture of its buildings. If you go there for nothing else, the architecture is a fantastic sight. If you are planning on going inside the complex you will not be disappointed by its contents. For a small fee you can take part in a guided back-stage tour that will give you the chance to see the ins and outs of operating a theatre. And if you’re a bit strapped for cash the Centre has a number of free art exhibitions and performances on the Glanfa Stage. For those of you who are interested in the Millennium Centre’s resident arts companies, Cafod on the ground floor offers you a great insight into who they are and what they do. And once you’ve worked up an appetite, there are cafes and an ice cream parlour to satisfy the sweet-toothed amongst you. If you fancy more than a snack the ffresh restaurant serves food made from locally sourced ingredients. 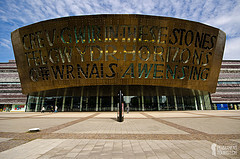 Ideal for a day-trip, the Millennium Centre is also popular for short breaks and as such offers a Theatre Breaks package in collaboration with Future Inn. This comprises bed and breakfast in the hotel and theatre tickets. So whether you’re just passing through, thinking of ways to spend the weekend or trying to come up with ideas for a gift, the Cardiff Millennium Centre has something for you. Opening Times: 10am-6pm. Closed Sundays. Times vary on show nights.